The exhibition brings together a selection of works by three artists; Alexandra Navratil, Erin Shirreff and Lara Viana, that build on fragmenting and re-shaping archives and memory. The work investigates issues of reproduction and the layering effects of media from multiple perspectives of personal and public territories. Lapses in time and scale telescope through transposing processes and techniques, and manifest in slide projections, paintings, photographs and video. This is the first time the three artists show at i8 Gallery. When we perceive an image, we are not just seeing its subject or its surface, we are seeing a combination of all the physical and chemical techniques, whether in paint, print or on film, used to create it; we are seeing how the material properties of that image, when viewed as an object, may have been manipulated or deteriorated over time; we are seeing the context in which that image has been presented and we are seeing all of these layers through the filter of our own personal knowledge, experience and associations. Alexandra Navratil, Erin Shirreff and Lara Viana are three artists who deliberately foreground these elements, enabling the viewer to slow down the act of seeing in order to reveal those processes, psychologies and histories. When viewing Lara Viana‘s paintings the eye constantly toggles between brushstroke and subject; past and present, flat surface and layered depth. The marks made by adding, rubbing, scraping and wiping paint away are as prominent as the indistinct forms and compositions they suggest. These ambiguous subjects could be based on old paintings or photographs; A set of steps? A group sitting? A couple kissing? Their muted colour palette, often monochromatic browns and blue-greys, also hints at the reproduced image, degraded or become faint. But Viana transforms them into something more personal and intimate and transports them here, now. Then there are the areas of ghostly translucent white, giving the impression of shapes emerging or dissolving, as if one were not looking at Viana’s paintings but right through them. The transformation in Alexandra Navratil’s installation Modern Magic (2013) has an alchemical feel. Not only in its subject, 162 images highlighting the initially revolutionary properties of plastic, taken from the pages of Modern Plastics magazines (1934–2004), but in the artist’s treatment of them. Analogue photographs, some no doubt originally made on slide film, printed in magazine pages and then subsequently digitised into an archive, are transferred by Navratil back into slides. Shown on two projectors, the images are split into those depicting hands manipulating the various shaped plastic objects, to demonstrate their flexibility, and hands showing the objects for display. This multiplicity of images might also remind of a benign form of ‘duplicity’. In her doubling of projectors and use of images of close-ups of hands, Navratil’s installation is a visual reference to another form of magic, the misdirection and sleight of hand of the conjuror’s ‘reveal’. Erin Shirreff uses multiple images in a different way. 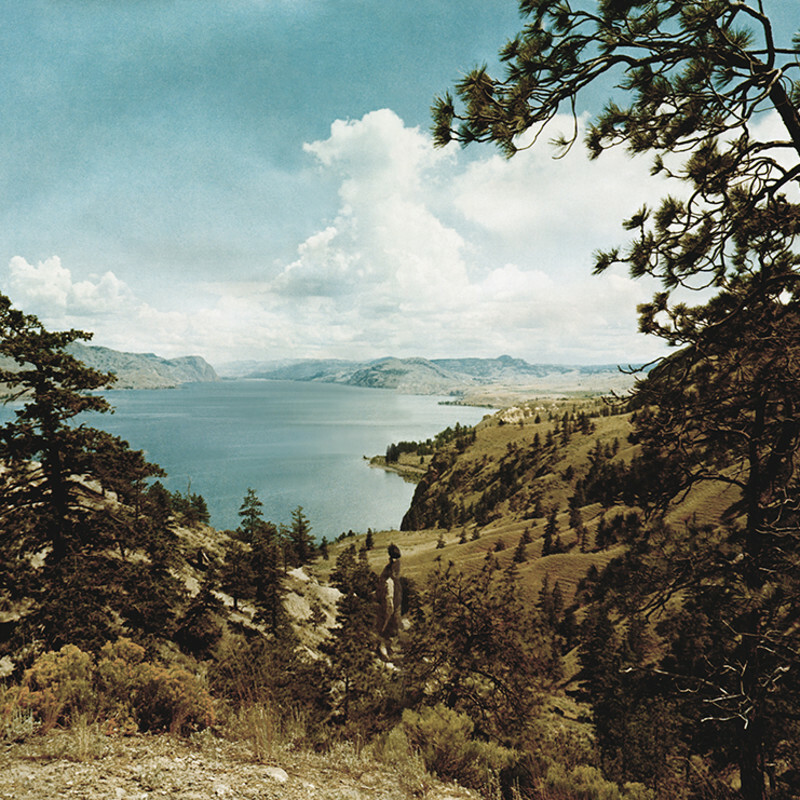 In her silent video Lake (2012), she takes a 1980s tourist photograph of Lake Okanagan, in her home territory of British Columbia, digitally photographs it under different light conditions and transforms the images into a digital animation. Reminiscent of John Martin’s dramatic Last Judgement triptych, (1851-3) and the theatrically animated, painted dioramas also popular at that time, the light effects not only mimic the moods and emotions associated with different weather conditions and times of day – uplifting bright sunlight, a romantic orange sunset, a dark stormy sky, but also mimic the process of analogue photography itself. At one point the image gradually fades into grey, as if there were a mist rolling in, or a blizzard white-out. When the details re-emerge, it’s as if the viewer were watching a photographic print, emerging from a tray of developing fluid. In an age of mass reproduction and quick-swipe, digital image overload it‘s easy to forget that in some way, all images are carefully constructed illusions. These works by Shirreff, Viana and Navratil show how these illusions come into existence through a series of transformations. These images collapse scale and travel through time and space, carrying with them not only the imprint of the objects they might represent but the history of all other reproductions of that image, not only reintegrating the emotional and psychological impact an image holds with its subject, but also reintegrating the memories of all that image‘s past selves.